There are few adjustments you can make to the carburetor of the 40-horsepower Johnson. It is a single piece, unitized in its construction except for the float bowl and carburetor cover, which are removable. Fuel metering is by a removable jet mounted in the float chamber. The mixture of this single-barrel, float feed-type carburetor is preset at the factory. The motor's idle speed is adjusted using a screw mounted on the side of the carburetor cover, that is jammed in place by a lock nut,. Turn the cover locking handle upward and remove the motor cover. Connect the alligator clip of a digital shop tachometer to the motor's no. 1 spark plug. Start the motor and allow it run until it warms to its normal temperature. Shift the motor into forward. The optimum idle speed range for this motor lies between 800 and 900 rpm, with the ideal idle near the center of that range. Avoid moving or hot parts. If an adjustment is required, loosen the lock nut on the idle speed screw with a small adjustable wrench and turn the screw clockwise with a standard slotted screwdriver to increase the idle speed or counterclockwise to decrease the idle speed. The motor must be supplied with water during this adjustment. You may supply water through a garden hose attached to a flushing attachment placed over the motor's raw water intake. 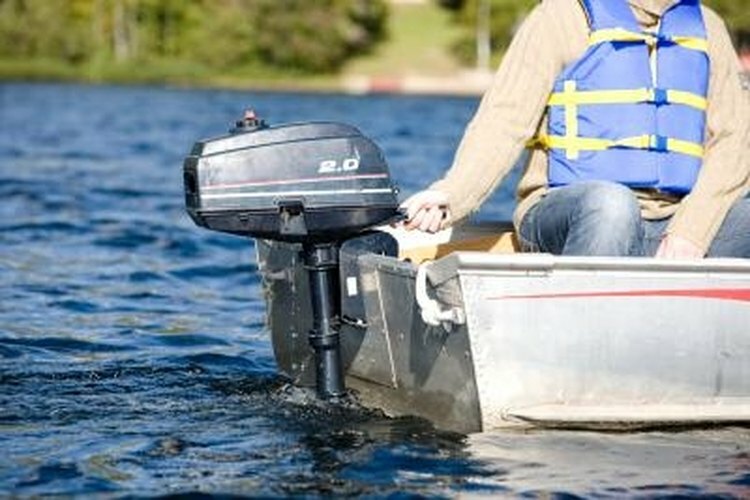 You may also make the adjustment when the boat and motor are in the water, with the boat tied to a dock.